Identify where Salesforce Billing adds value in the lead-to-cash process. 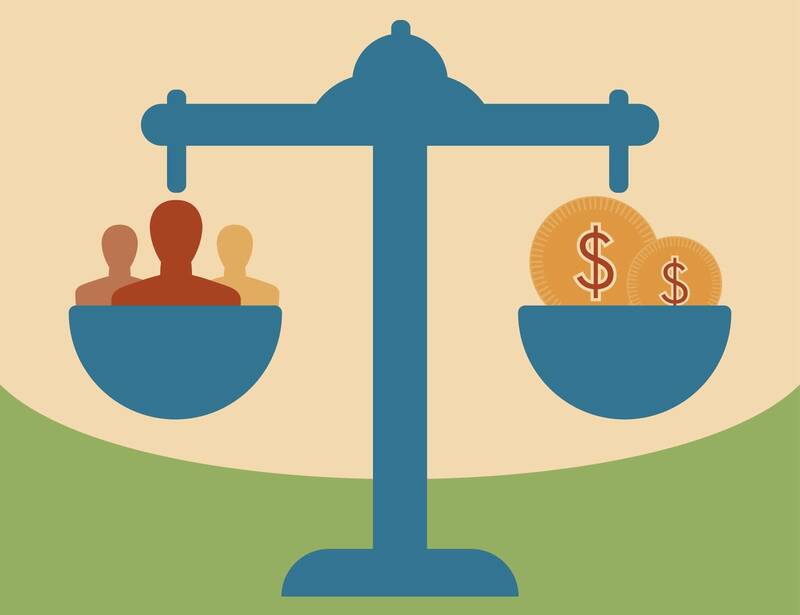 Articulate the importance of Finance’s relationship with Sales. Explain the value of relationships and process when it comes to the revenue lifecycle. As the Salesforce name implies, we started with, and have spent a lot of time on, solutions to help companies sell better. But over the years, we’ve grown into a platform that seeks to help your business or nonprofit improve relationships, both externally with your customers and internally among different teams within your company. Salesforce Billing does both—improving the service delivery and payment experience for customers and optimizing how Finance works with Sales and other teams. You may be a trailblazing controller looking for innovative ways you can deliver more value to your company. You may be an intrepid sales rep interested in the nitty-gritty of what happens after you close your deal. Or maybe you’re a rockstar admin on a mission to make more people in your business happy. While we are definitely going to put on our Finance hat for this module, we designed this course to deliver a clear view of the revenue process as we see it and explain why this is more than just a discussion of finance tools. We’re happy to have you along for the ride! 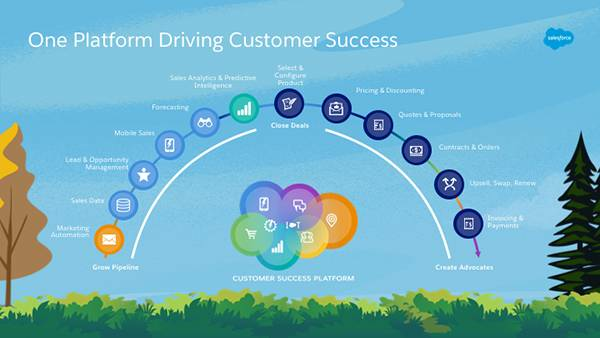 As a whole, Salesforce enables you to delight your customers across every touchpoint, from Marketing to Sales to Finance to Service and virtually everywhere in between. This is what we call lead-to-cash. When you think about where Salesforce Billing is in that process, you first drill down into the Sales Cloud. It’s where you manage sales data, leads, and opportunities, all the way to the configure, price, and quote (CPQ) process with Salesforce CPQ. At the tail end of that, your business would generate contracts and orders, setting up the foundation for billing your customer–and that’s where Salesforce Billing sits, as an add-on to Salesforce CPQ. We discuss why later in this unit. But it’s important to first identify some of the higher-level benefits. Recurring Business/Recurring Revenue. Many companies are moving to a recurring business model. This means there’s a healthy appetite to add services or subscriptions to what they offer. Think of a manufacturing company also selling warranties, or a software company offering subscriptions. Many traditional, siloed systems do not have the functionality to manage the complexities that go along with a recurring business, such as how to treat the concept of time, contract amendments, and proration. This is where Salesforce Billing shines. True Cross-Team Collaboration. This is a little more abstract than recurring business, but bear with us. When you’re on a single platform, working off of a single toolset, you have the ability to work more closely with teams that may have been siloed in the past. Think about introducing a new product or subscription. It’s more than just adding a line item to an order. There’s a whole process from selling to billing that you have to think through and then execute. This is the promise of our platform. Both of these concepts come into play throughout this module. So keep them top of mind. There are more things in the customer lifecycle that affect invoicing, payment, and reporting on revenue than just the tools you use. 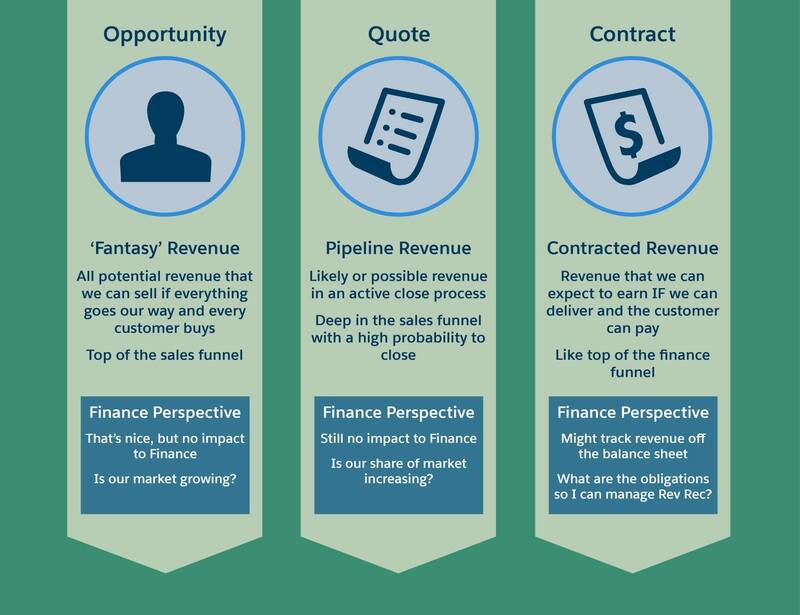 In order to be an effective financial controller for your company, you have to consider the revenue lifecycle. And guess what? It starts with Sales. This is why we’ve designed Salesforce Billing to be an add-on to Salesforce CPQ. The opportunity, quote, and contract stages—all managed by Sales. In the past, Finance wouldn’t need to worry too much about them–there’s nothing to report on, let alone to process. It’s all “fantasy revenue” (as some may call it). But what happens at these stages impacts the billing process more than one would think. Your Sales teams work offline—spreadsheets, emails, paper contracts, and so on. Do you find your organization having to track down critical data or needing to go through multiple reviews before starting the billing process? Reconciling add-ons and upgrades is an arduous process, as you have to consider what has already been billed, delivered, and reported on. Then you have to calculate or even recalculate proration. And the Sales team keeps on selling. Introducing new products or business models is long and painful. Is there a disconnect or long ramp time when a new product gets sold? Does the thought of pivoting to hybrid or recurring revenue give you pause? You need to know more about the customer, but there isn’t much to go on. Purchasing data is incomplete. It’s hard to determine if service was delivered on time. More can be added here, but the key concept should be clear—Finance, Sales, and Sales Operations are interdependent. How deals are closed, what data is captured, and how fast you can adapt to change all determine how well you can do your job. And much of this complexity is managed by Salesforce CPQ. Does bookings, billings, and cash sound like familiar territory? This is where Finance starts getting down to business, especially around invoices. And, if the quote is done right, if the contract and order have the right prorated amounts, and the right credits and discounts are applied, billing goes off without a hitch. You can get the invoice out quickly; customers experience a reliable post-sales process; we all go walking hand-in-hand into the sunset. Okay, it’s not that simple. But in a world of interconnectedness, it truly does take more collaboration to succeed. Salesforce CPQ and Salesforce Billing enable this to happen more than any collection of siloed systems can. 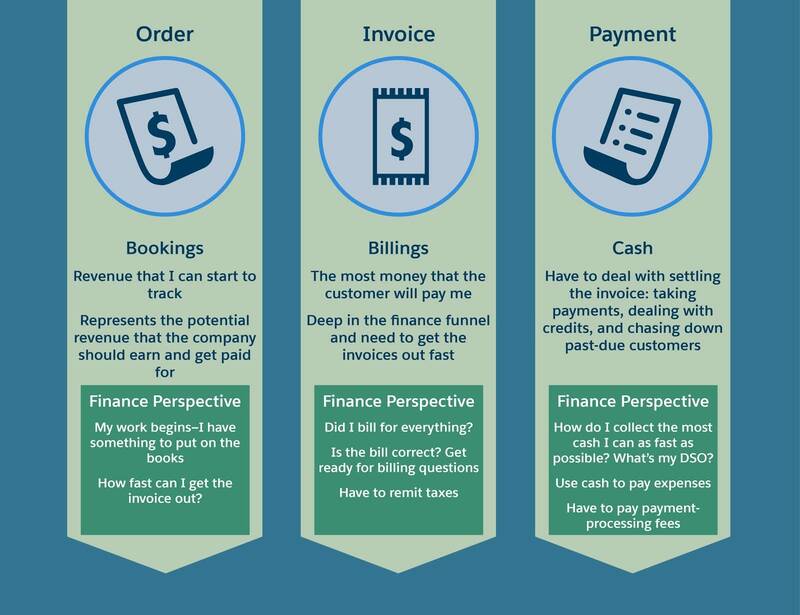 By now, you may be getting the sense that our point of view on billing is focused on the relationship between Sales and Finance, as well as the relationship you have with your customers. Just as important are the platform and processes you have in place (or don’t have) and how they’re affecting these relationships. It’s about the long game. As we mentioned in our Salesforce CPQ Features module, when you focus only on tools that get you what you want today (asking questions such as, “Does this tool do XYZ?”), you invariably pigeonhole yourself to short-term gain. At best, you achieve a small, temporary boost in transactions and revenue. 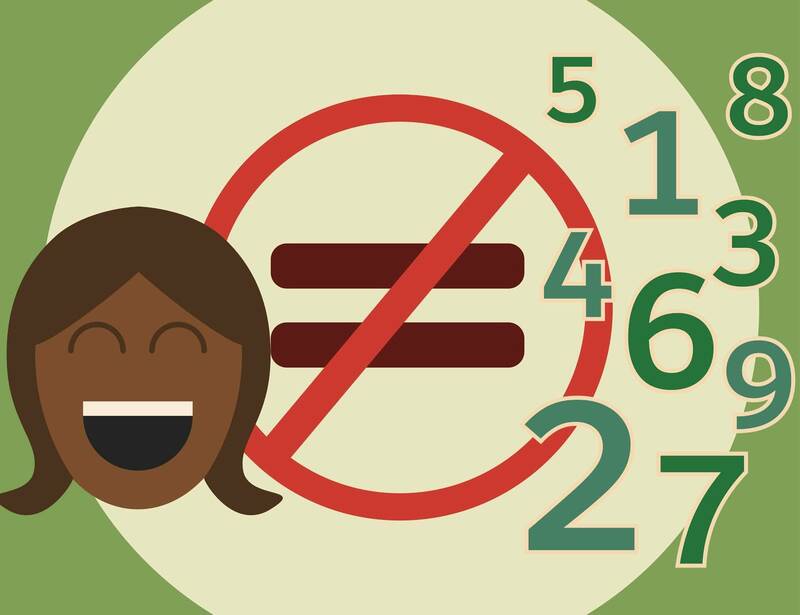 At worst, you’re treating customers like numbers. But when you focus on relationships (asking questions such as, “How can Sales and Finance work better together?” or “How do we put the customer at the center of everything we do?”) and a technology platform that helps you transform, you strive to turn customers into advocates and earn repeat business. And it’s OK to demand amazing features, too—we won’t fault you for it. As we dive into some of those features for Salesforce Billing in this module, we highlight how we get you closer to this goal.